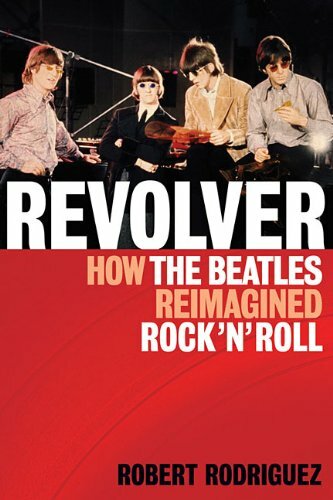 Robert Rodriguez' book, Revolver, an historical work on The Beatles. It takes an intelligent and insightful look behind the scenes, as well as what was transpiring in the minds of the Fab's in 1966. Indispensable to any Beatles fan, as well as the casual music listener, it raises broad concepts about music production in general. The book is enjoyable to read as well. Rodriguez is an academic, though his writing style and approach is never overbearing and easily accessible. Moreover, Revolver is a thorough and exhaustive recording diary. Tech heads will definitely get a kick out of this book and I highly recommend it. It documents how The Beatles used then cutting edge technology as a means to an end. While production was important, it never hindered the organic process of creating music. If the Beatles were recording today, the impression is that they would more than likely be staunch advocates of Pro Tools and the like, as opposed to analog technology. Mr. Rodriguez makes a valid argument in proving Revolver to be the turning point for the Beatles with regards to becoming a studio band. The central running theme implies that Revolver and not Sgt.Pepper, was basically the big game changer for the Beatles as well as the music industry itself. One critique of the book, however, is that Rodriguez does not follow through in his attempts to de-throne Sgt. Pepper. Throughout the work, especially towards the end, I was constantly under the impression that Rodriguez had a personal bias against Pepper. Whether this interfered with validating his opinions, no one can really say. Most rock historians and fans alike agree that Pepper- not Revolver, was the game changer for popular music. (And of course there would be no Pepper without it's Freak Out/Pet Sounds influence.) The bridge between Revolver and Pepper was the single, "Strawberry Fields/Penny Lane." Rodriguez views both songs as classic, innovative and seminal. But when he discusses Pepper, the album seems somewhat despised. If we consider the timeline, Sgt. Pepper gave birth to various genres of music (as did Revolver), leading to progressive rock and contemporary pop, among other important genres. Sgt. Pepper was the logical outcome of Rubber Soul and Revolver. While continuing with similar themes and instrumentation, the only difference would be the overall production as a departure from previous albums. And rightfully so, because technology, due its incomplete and imperfect nature, is in a state of constant repair and update. Hence, if Sgt. Pepper were released before Revolver, we might not be having this debate. The depth of the book raises issues which the fans and readers will face and explore. This adds to the book's interest. In any case, Revolver is indispensable for a grass roots understanding of what it takes to make great music. About The Author: Marc C. Cancassi is a freelance writer and composer. He currently resides in Queens, N.Y.